The word destiny is thrown around all too often in sports. In the NLCS, destiny was well used and in full effect. Could the NLCS end any differently? No, it was destiny to go to Game 7 with the San Francisco Giants and St. Louis Cardinals playing. The Cardinals had won six straight elimination games in the postseason and the Giants had won five elimination games in this postseason alone. These two teams are never out of a series no matter who has the lead. Really though, what else could Giants fans expect, besides exactly what has happened? This is a team whose slogan the past few seasons has been “Torture.” This is a team that lost their bearded assassin Brian Wilson for most of the season. The same team lost their All-Star game MVP Melky Cabrera to a 50-game suspension for taking HGH. Oh, and their two-time Cy Young winner Tim Lincecum led the National League in losses and ERA. Need I say more? Yeah these guys know adversity a little bit. So, when they went down 0-2 to the Cincinnati Reds in the NLDS, was it really that big of a surprise they won three straight games to win the series? Yes and No. The Giants became the first team in NLDS history to accomplish the feat, but if anyone could do it, the 2012 San Francisco Giants were the ones that could. Then, the Giants found themselves down three games to one against the reigning World Series champions. The St. Louis Cardinals know how to win in the postseason and they could not let the Giants work their magic again. But, wait! Orange October is still alive in San Francisco! Thanks to #RallyZito, #RallyVogey, #RallyEnchilada, #RallyHorse and #RallyCain, the 108th World Series will be in San Francisco. 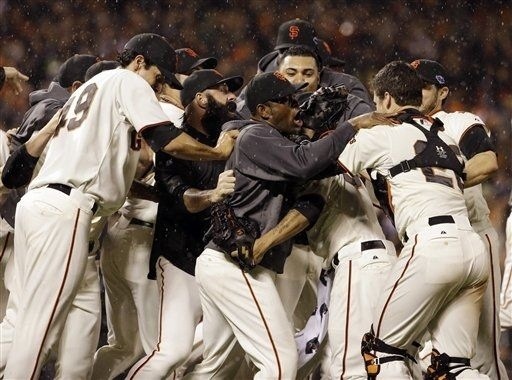 The Giants defeated the Cardinals 9-0 to complete an amazing NLCS. Again destiny found its way to San Francisco with Marco Scutaro getting Matt Holliday out to end the game. The last NLCS Game 7 was won by the Cardinals in 2006, who went on to beat the Detroit Tigers in the World Series. Six years later, the Giants now have their turn to do the same to Detroit. With guys like Buster Posey and Pablo Sandoval in the lineup, they were bound to be the heroes of the Giants offense right? Well Posey may end up being the NL MVP, but the NLCS MVP was a much more unlikely hero. Marco Scutaro continued his heroics and was awarded with NLCS MVP. Scutaro had three more hits in Game 7 and finished with a .500 (14 for 28) batting average in the NLCS. His 14 hits are a new franchise record and tied the all-time LCS record. Scutaro was the best pick-up of the 2012 season. He seemed like another veteran move by GM Brian Sabean that would help out, but not be a real difference maker. Oh, what a difference he made. In 61 regular season games with the Giants, Scutaro hit .362/.385/.473. The 36 year-old veteran played like an MVP and has continued to in the playoffs. Matt Cain was not himself going into Game 7, but proved he is an ace with another huge playoff win. Cain became only the fourth pitcher to win the All-Star Game and a Game 7 in the same season. The Detroit Tigers have been dominant this postseason, but whatever the series is at, do not count out the Giants. The Tigers have more firepower, but the Giants have beat adversity with class-acts like Scutaro and Ryan Vogelsong. AT&T Park will sound like a World Cup soccer game, they will find another great rally symbol and #OrangeOctober is still alive in San Francisco. ‹ Wild Weekend of Sports: All Aboard The Kleinapple Express!